Lifafa paratha or Palak Paneer Lifafa Paratha is a paratha which is of envelope shape and stuffed with flavorful palak paneer filling. Lifafa literally means envelop or pocket. Filling seasoned with spices, stuffed in the roti(flatbread), sealed like an envelope before cooking on stove top. Basically, a roti folded into a lifafa or pocket shape with filling inside. In this lifafa paratha, we can stuff any normal filling because it is just a fold which describes this paratha. I made Palak Paneer or spinach with cottage cheese filling which is stuffed inside the whole wheat flour roti and then sealed it like an envelope. Palak paneer lifafa paratha is very nutritious and wholesome. Palak paneer combination tastes superb when stuffed. This paratha tastes better than plain paneer paratha. Had seen this combination in a page a few years back during my non-blogging days. Since then I keep making this palak paneer paratha in an envelope shape. Palak paneer lifafa paratha is very simple to make. To make filling you need grated paneer, chopped spinach, freshly grated garlic-ginger, cumin seed powder, chopped green chili, and kitchen king masala. Roll out a roti or flatbread, place 3-4 tbsp filling and fold like an envelope. Dust with dry flour and gently roll out. Cook from both sides and lifafa paratha or palak paneer lifafa paratha is ready to munch. With curd, this paratha tastes great. “Chutney” or “raita” will go well with this palak paneer lifafa paratha. 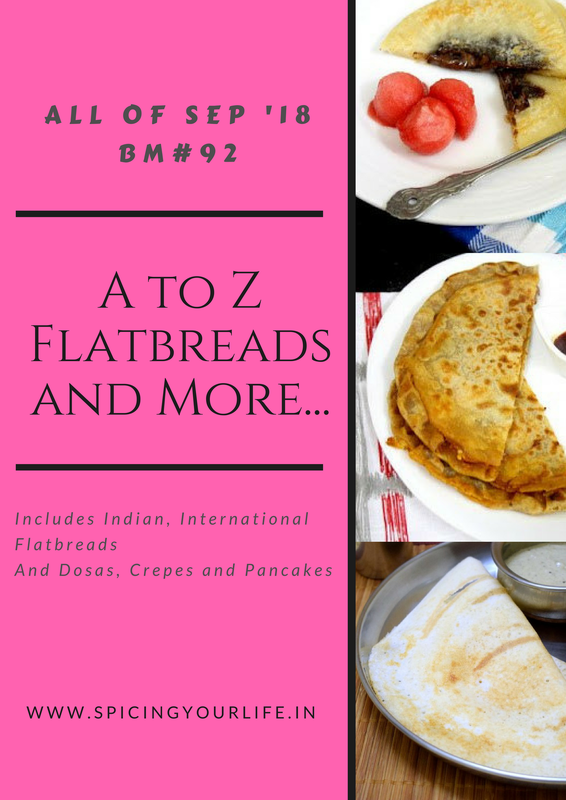 You can check more paratha recipe under “Indian Flatbread“. So let see how to make this nutritious palak paneer lifafa paratha. You can easily scale up or down this recipe as per requirement. Mix all ingredients for the dough and knead it well with warm water. Keep this aside until filling is ready. This will also make the dough very soft. Wash and clean spinach(palak). Rinse nicely to get rid of all the water and then chop it finely. Grate paneer(cottage cheese). Mix all spices listed under “stuffing” and prepare the filling. You really have to mix with hands so that palak(spinach) gets to mix with rest of the ingredients. Adjust salt as per taste. Don’t keep it for long otherwise, palak will start leaving water due to added salt. Now stuffing is ready to be filled inside. 10-12 parathas(flatbread) can be made with this dough quantity. Depends upon the size you wanna make. Divide dough and filling into equal parts. Roll out a circle of about 6-7″ in diameter. Place 3-4 tbsp filling inside the roti and seal it like an envelope. Dust this filled envelope shaped paratha with dry flour and roll out gently to flatten it. Place this rolled out paratha on the griddle and cook from both sides until brown in color. Repeat the same with other dough balls. Palak paneer lifafa paratha or stuffed cottage cheese with spinach flatbread is ready to serve hot with curd, pickle or any chutney/dip. Adjust chilies as per your taste. Rinse palak(spinach) carefully. Any amount of water with make stuffing wet and it cannot be rolled out afterward. Garlic gives it a unique flavor so add it for sure. I made the same paratha with a mixed vegetable filling and my daughter loved it. I was asked to repeated it right away, so I know kids will love this paratha! Yeah I love this lifafa paratha because you can stuff a lot of filling in it. Thanks Ritu, do try once you will fell in love with this lifafa paratha surely. Palak paneer is a classic combo and using that in filling is so nice! These pocket parathas are so healthy na! Thanks PJ for liking lifafa paratha. Lifafa paratha is really great stuffed paratha… for lunch boxes. I made something similar called Gozleme with spinach and feta. The folding is also very similar to the lifafa paratha. It is so interesting to see different countries have similarity in food. Looks great! Really this surprises to me too. But love these variations and names. I bet somebody came up with the lifafa paratha name to entice kids to eat… love the filling as I have a weakness for paneer. Wow, an interesting way to add vegetables to your diet and a good travel food. Delicious. Oh wow ! The combination of Paalak Paneer is a classic combo and making a stuffing with it for a Lifafa Paratha sounds fantastic . I have made the Pocket paratha with a different stuffing but these parathas surely look and attract everyone ! Wow! this is taking palak paneer paratha to another level. Superb one, Bhawana. That is one tasty envelope! And with the classic combo of palak and paneer, it is a treat for all! Perfect meal for any time of the day! The letter shaped paratha looks so good. Spinach and paneer are awesome together. With such a delicious filling, these parathas would make a filling meal..